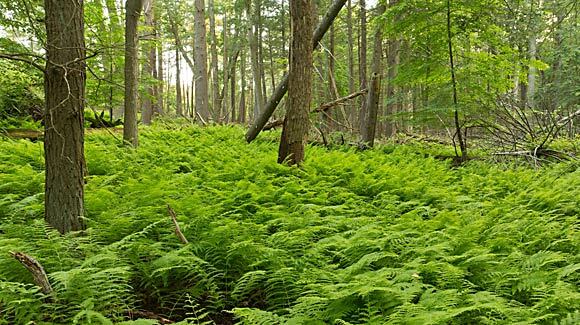 In February 2011, Scenic Hudson protected 13 acres that expand our Shaupeneak Ridge Preserve and offer the possibility for an additional hiking trail. A newly purchased addition to our Shaupeneak Ridge Preserve.Robert Rodriguez, Jr. Protecting this land—surrounded on three sides by Scenic Hudson's Shaupeneak Ridge Preserve— increases to 700 acres the size of this popular destination for hiking, bird-watching, mountain biking, fishing, hunting and school field trips. Buffering the preserve from potential development or logging, the acquisition also safeguards ecologically sensitive vernal pools and offers an opportunity to create an exciting new trail affording magnificent Catskills views. Lying within the state-designated Shaupeneak Ridge Biologically Important Area, the forested property further protects the interconnected habitat networks on which many species depend. Like all woodlands, it also sequesters carbon and other harmful pollutants, and collects and purifies water that filters into the ground to recharge the local aquifer, a community's prime source of drinking water.